Newton Kumar exactly that idealist from Hrishikesh Mukherjee’s film grappling with the political irony of a country where a majority is too poor and illiterate to vote. 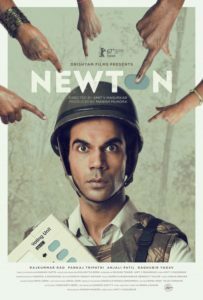 Rajkummar’s Newton is the guy who will shine if not outshine the competition by the strength of his convictions. This is one more triumphant performance for Rao who has made a habit of conferring a brilliant narrative to every character he plays. Really, it’s become a force of habit for this actor. On the surface not much seems to happen in Newton. Writer-director Amit Masurkar is not sold on creating drama out of his plot’s melting pot. He instead lets the characters walk that talk which exposes corruption with resorting to propagandist prattle. Newton doesn’t fall into the trap of making its idealistic hero so above the democratic system to appear a messiah in the making. On the contrary our diminutive hero often seems ridiculous in his stubborn adherence to guidelines and rules. There is a sequence at the very end where Newton’s friend a level-headed quietly intelligent Adivasi girl (Anjali Patil) drops in at his office and suggests they go out for tea. But Newton won’t leave for another 5 minutes until his official lunch break starts. As time ticks by we see the couple waiting, while we, sadly, must bid them adieu. This is the kind of cinema where the characters must never entertain us by acting larger-than-life. The setting is a Lok Sabha election constituency in the heartland of Chattisgarh where Maoist violence has rendered the electorate redundant. Who was to know that a spirited idealistic election clerk would suddenly break through the inertia of non-performance in the jungles of Chattigarh. Rajkummar Rao excels as the punctilious electoral babu trying so hard to do the right thing he finally ends up on the wrong end of the firing line. From that nervous blinking of the eye that Rao has assumed for his character to his simmering righteous indignation expressed in welters of idealism, the actor excels in a role so devoid of high points it feels like life. Pankaj Tripathy as the local government official impatient to get the election over it and Anjali Patil as a local girl who accompanies Newton (so named by self because he didn’t like his original name Nutan) to the interiors of the inaccessible jungles for a day in the electoral battle, imbue their habitual brilliance to the plot. The narrative is in no hurry to draw up a convincing case for Newton’s rigid idealism. He is what he is, and we accept his idiosyncrasies in the hope that he will eventually surprise us. And he does. Adding to the flavour of unflinching realism is the authentic locations. The jungles virtually speak to us in every frame. Swapnil Sonawane’s cinematography denudes the magnificence of the location to focus on the drama of the mundane. As Newton and his bored colleagues proceed into places where voting is unthinkable, we are given a sense of the democratic process having to a go long way before the Newton Kumars at the bottom of the bureaucratic ladder can see the dawn of a new era. But then if we want to make a difference we can’t remain indifferent.